Delicious, comforting, easy and budget-friendly, what more could you want out of dinner?! 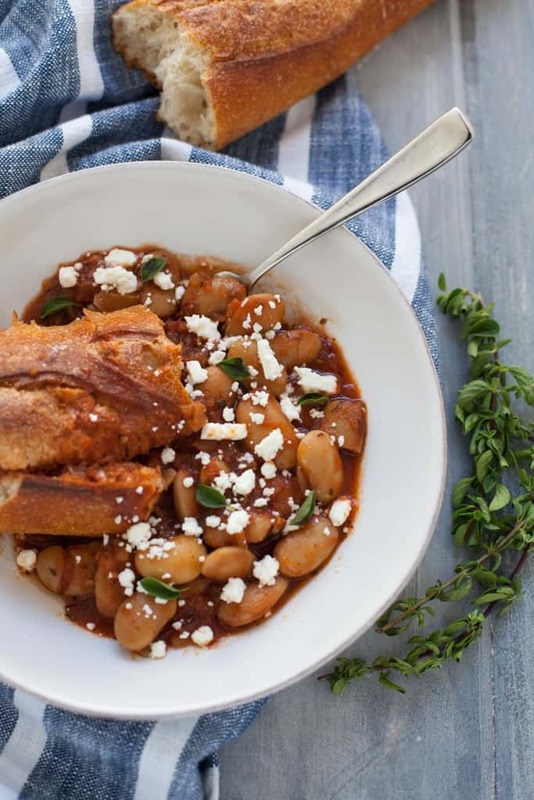 These slow cooker Greek baked beans fit the bill for all of the above. This recipe has been a long time coming. Ever since we got back from our honeymoon in Greece, I wrote down all the recipes I wanted to re-create at home. However, in an attempt not to bombard you with an overload of Greek food and trips down memory lane, I decided to space things out a little bit. I wrote down Greek baked beans on the editorial calendar and kept pushing it back and back until it finally felt like a good time to post. In January, I’m all about warm comfort foods, soups, stews and my slow cooker. 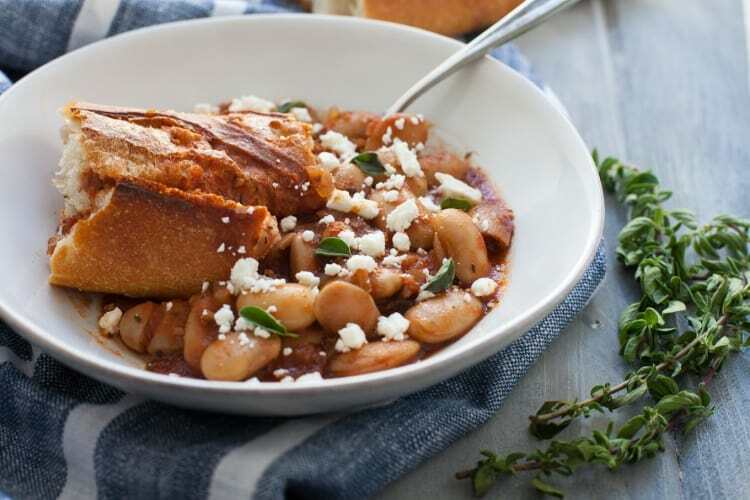 So making these Greek baked beans in the slow cooker this month seemed like the perfect idea. Oh, and perfect it was. I’ve made these twice now in the matter of a few weeks and Steve and I can’t get enough. In fact, it was the first time that Steve repeated “wow, these are really good” randomly during the middle of the meal without me having to ask what my #1 taste-tester thought. As soon as he uttered those words, I knew we had a winner. 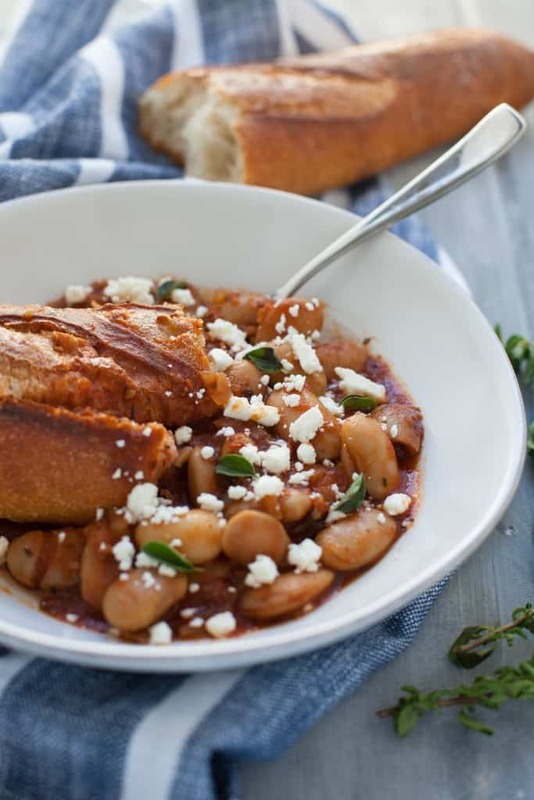 Giant Greek baked beans (or gigantes as they call them in Greece) was the first meal I had when we touched down in Greece. It was after 12 hours of overnight travel and we had just checked into the hotel and wanted to eat (and drink all the espresso) at the first place we laid our eyes on. Lucky for us this cute little authentic Greek restaurant was in an arm’s reach from our hotel in Athens. We sat down taking in the surroundings in between rounds of drowning the fresh baked bread with the BEST olive oil. It was there I ordered my first (true) Greek salad and the gigantes (giant baked beans). I was in foodie heaven. The beans were so tender and the tomatoes and spices were perfect for sopping up more bread ;). 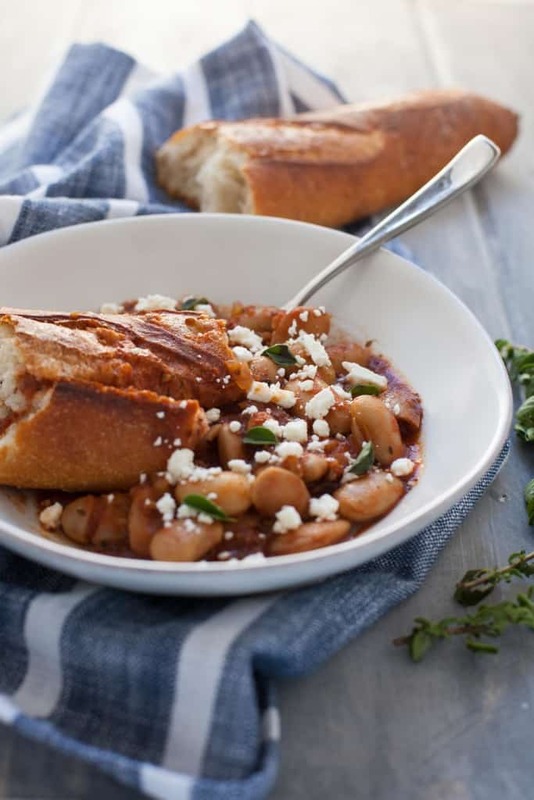 Now I realize that calling this recipe Greek baked beans is a bit of a tease because they never set foot in the oven. 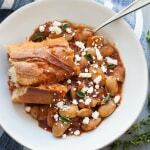 But there are already a bunch of gigantes recipes on the interwebs so if you want to bake yo beans, check out another recipe. If you want to save TIME and ENERGY and throw them in the slow cooker for an equally delicious meal, stick with me. I made this recipe for the second time earlier this week and I finished the prep in less than 15 minutes, threw all the ingredients in the slow cooker, turned it on low, went to bed and woke up in the morning with a ready-to-eat meal for dinner that night. I made the recipe once without soaking the beans beforehand and once with soaking the beans beforehand. I think the beans were slightly more tender after soaking but if you want to make this last minute and don’t have time to soak the beans, it’s not the end of the world. Plus, not only will this recipe save you time, it will save you dollah dollah bills ya’ll. This month’s Recipe Redux theme is budget-friendly eats. They challenged us to create a recipe that costs less than $3 per serving to help you keep your food costs in check for 2017. Let’s do a breakdown, shall we? This assumes that you already have olive oil and spices (oregano, thyme and bay leaves) at home. Total: $8.28 for 8 servings. That’s $1.04 per serving!! So even if we added olive oil and spices to that equation, it still would be under $3/serving. Talk about a budget-friendly meal that’s sure to satisfy. 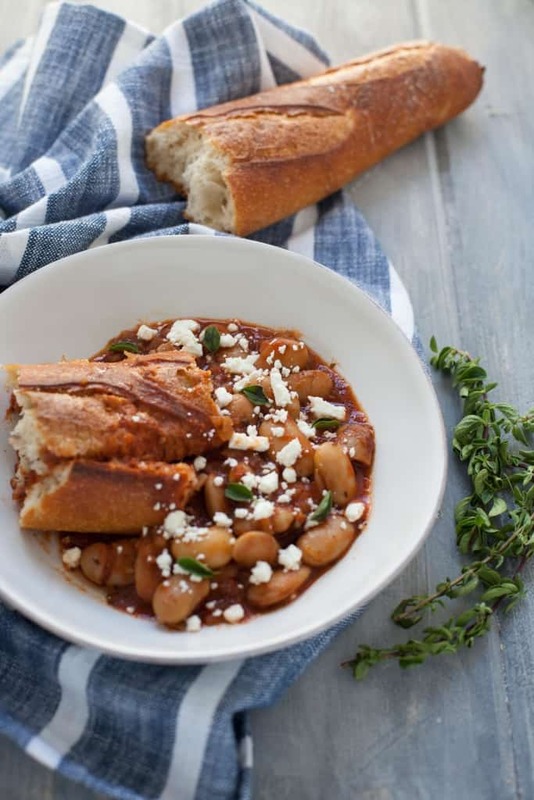 Steve and I paired the beans with some fresh-baked bread and feta cheese for a well-rounded meal. And if you’re only cooking for one or two, don’t worry. The dish freezes well so you can rest assured you won’t have to waste any leftovers. We just put leftovers in the freezer before we left for San Fran for a work trip this weekend. Bust out the slow cooker, my friends. It’s time to make some beans. Place all ingredients in the slow cooker. Cook on low for 7-8 hours. 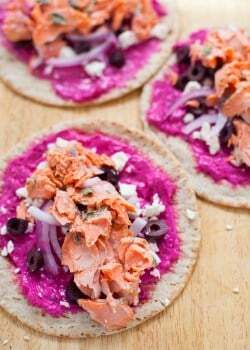 Serve with fresh baked bread and feta cheese. *Soaking beans overnight is recommended, but not absolutely necessary. *If you can’t find gigantes or large lima beans, regular lima beans will do the trick. Tell me, have you ever made beans in the slow cooker? Ever tried Gigantes in Greece? 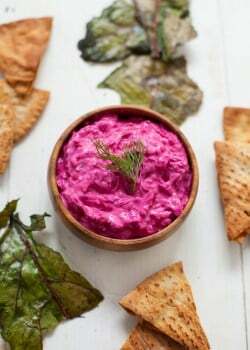 For more Greek-inspired eats, check out my recipes below! After 8 hours on low the beans were still not cooked. Has this happened before? Totally crunchy. Very excited to make this tomorrow! I started soaking my large Lima beans this afternoon. Just curious – is it normal for the skin on your beans to shrivel, and for lots of beans split/break when you soak them? Not sure if I should remove all the skins tomorrow after soaking. Right now they are a mess! I have made gigantes many times since visiting Greece, but always in the oven. I have tried many different recipes to get the balance of beans and tomatoes just right. You got it just right!!! Thanks for sharing your recipe. 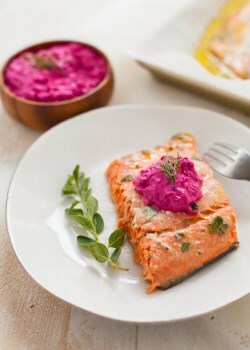 I’m making this dish as I write this, in my clay Cazuela. You guys just WOULD NOT believe what cooking in clay does for dry beans! I sure didn’t believe the hype till I tried it the first time. Just wow! I’m using Rancho Gordo”s Giant Corona beans, they are so creamy and delicious. I brined mine first, adding fresh herbs from my garden for 8 hours, rinsed well, and started. Try it, you’ll like it! Nice! Thanks for sharing, Marco – so glad you enjoyed it!! I made these with lima beans and they were AMAZING. My roommates and people who lived in the apartment next to us commented on how good it smelled cooking! So, so happy with this recipe. Thanks Kara! This looks amazing! I never think to use my slow cooker for things other than protein focused entrees so I’m definitely going to start, especially with this recipe. Thanks, Catherine! Oh, how delicious. I’m planning a trip to Italy in September so will need to hit up Northern Italy for that dish! Thanks – hope you enjoy it! Great recipe, perfect for winter and so simple! I have a quick question about your recipe. What temperature did you set your slow cooker, low, normal or high? I just purchased an Instant Pot and am using the slow cooker option to prepare your recipe and it has the 3 slow cook temperature options. Thanks for posting this recipe! Hey Cathy! My slow cooker only has two options – low or high. I used the low setting for 7-8 hours. Enjoy! We are huge fans of gigantes in our house! I can never get enough of them! Also spent our honeymoon in Greece -such a great trip! Can’t wait to try your recipe! Yesssss! I mean, how could you not love gigantes having been to Greece?! Thanks, Jessica! Cheaper on ebay. Quick shipping. Add bone broth instead of water for better nutrition. If it were up to me, you COULD post all Greek recipes….as each is a trip down memory lane for me…since we spent our honeymoon in Greece too! I’m adding all the ingredients to my slow cooker right now. I’m not kidding. Haha glad you’re on board, Serena! Awesome – let me know how it turned out!